2 chambres 1 salle de bain 1 salle de douche dans un endroit paisible au cœur du quartier médiéval avec un jardin privé. Chocolat boîte chalet au coeur de la ville de Saffron Walden de marché et pourtant situé dans une rue calme à quelques minutes à pied des commerces et restaurants de la ville. Le chalet a récemment subi une rénovation pour inclure une nouvelle cuisine, salle de bains et salle de bains conserve encore tout son caractère historique. Le chalet est fortement rayonnait avec une grande cheminée feu de bois à deux chambres, planchers de chêne à l'étage inférieur. Il a une petite et très privé jardin de la cour. La propriété dispose d'un parking sur la route disponible à l'extérieur. Idéalement situé pour explorer Saffron Walden et de Cambridge et de Londres est facilement accessible par la station locale Audley End qui se trouve à 5 minutes en voiture de la maison. Salle de bains comprend baignoire avec douche à main, wc et lavabo. En-suite a une douche, lavabo et wc. Les deux salles de bains ont chauffé les porte-serviettes et des points de rasoir électrique Tous les accessoires de salle de bains ont été installés en 2013. Extérieur: La propriété a une petite cour privée avec table et chaises pour six. Barbecue disponible. Courtyard a la frontière qui est fortement planté de jardin. Service de nettoyage / serviettes / / Femme de ménage: Les serviettes et les draps sont inclus avec le nettoyage et le changement du linge de maison hebdomadaire. Autres: Salle à manger a une table à manger extensible avec des sièges pour 6 et est ouverte à la cuisine. Cantou avec le feu électrique. 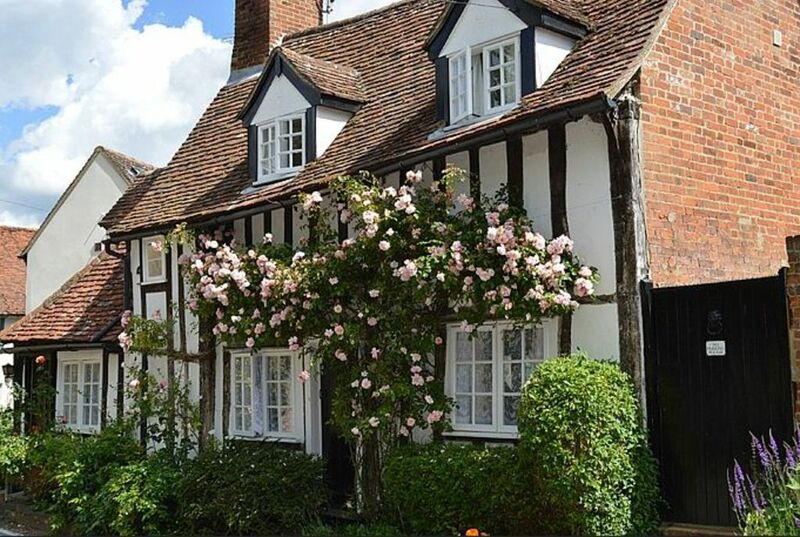 Drake Cottage is beautifully presented and well equipped, situated perfectly for our three day stay in Saffron Walden. The cottage is truly amazing. It is well equipped, cosy and relaxing. The decor is modern whilst still very complementing of the era, all the finishing touches are perfect. All the rooms were spotless. The beds were so comfortable it was a struggle to get up and explore. The location is perfect for a trip to Cambridge or London or just stay in Saffron Walden, which is a lovely town. The kitchen has everything that you could want for a weekend or a longer stay. We loved our stay here and would recommend it to everyone. Thank you so much for such a wonderful review and so glad you enjoyed your stay at Drake Cottage. We recently repainted the entire interior and replaced equipment to make it better for all of our guests. Next the exterior. Do let us know if there was anything we could improve on as that's the only way we get to improve. Hope we can welcome you back to the cottage in the future. So glad you enjoyed your weekend at Drake Cottage and do wish I could do something about those low beams but they are part of its charm.If it's any compensation I manage to bump my head at least once on every visit. May have to start outfitting our guests with helmets - duck or grouse :-) Hope we can welcome you back to the cottage on a future occasion. Everything we expected and more, this was the perfect retreat for our family at Christmas. We really didn’t want to leave! Drake Cottage is a special place set back in time. Sitting at the fireplace very early one morning, i wondered who may have sat in the same place hundreds of years before, to warm their toes! The walk to Audley Park, which surrounds the beautiful Audley End estate, is minutes from the front door and lends a feeling to being here, that only the experince can reveal. A little further away, my son and I enjoyed an early aftrnoon stroll through the Bridge End garden closeby. It’s a wonder that this cottage has survived all these years and the owner has maintained the old charm of the place, while at the same time incorporating a modern standard of comfort. It is very well equipped with most of the things one needs for a comfortable stay. The property manager, Lucy, was absolutely wonderful. She not only bought a fresh Christmas tree, but also had it decorated beautifully for us. All we had to do was switch on the lights! She was very responsive to our needs. Thank you Lucy, we appreciated your effort very much. We look forward to staying again at Drake Cottage! Dear Linda, thank you so much for your amazing review of Drake Cottage and so glad you enjoyed Christmas in Saffron Walden. When I stay at the cottage I often start looking up all the things that have happened in history since the cottage was built. Glad you got to walk in Audley Park and got to Bridge End Gardens- did you find the hedge maze ; I always love going round it even though I know my way into the centre by now. Lucy always does a great job of looking after our guests and I will make sure she sees your review. Come again to visit us soon. Gare Audley extrémité 2 miles - temps de Voyage à Londres, Liverpool Street 1 heure. Accès M11 moins de 3 miles. Cambridge 15 miles de Londres, 40 miles, sur Audley End House and Garden de 3 miles. Saffron Walden Ville Trail, musée et du château 200m. Fry Art Gallery et Bridge End Gardens deux minutes à pied de là. Plusieurs maisons publiques, des restaurants et des commerces de proximité dans une courte distance de marche, y compris un bureau de poste et de l'information touristique. Un bureau de poste, plusieurs banques et supermarchés sont à 10 minutes de marche. Booking Notes: We accept credit card bookings only via this site and also bookings by conventional mail, email or telephone. Deposit on confirmation. Full payment 6 weeks prior to stay. More information about the cottage can also be found on the website www.DrakeCottage.com Changeover Day: We do not have a specific changeover day. Weekend bookings may be possible out of high season. Arrival after 4 p.m. and departure before 10 a.m. Notes on prices: Weekends and short breaks available out of high season by arrangement. The cottage if available is charged pro rata per night for use of two bedrooms with an additional £30 charged per person on the total price for use of the sofa bed. Apologies but this is due to laundry and housekeeping costs. Do please enquire. Your deposit is non refundable but please contact us if you do have to cancel and if we get a replacement booking we are happy to give you a refund.